The rookie is coming off solid debut playing with the backups and is expected to get his initial game experience working with the projected starters. Nothing breaks up the tedium of an NFL preseason quite like the unveiling of a potential new quarterback savior, and so it is with the Jets this August. Every fan’s eyes (joined by a national television audience) will be on FedEx Field on Thursday night when - barring a shocking twist from coach Todd Bowles - Sam Darnold will start against the Redskins. The rookie looked good playing with and against backups last week against the Falcons, going 13-for-18 for 96 yards and a touchdown. Then he spent three days in Richmond, Virginia, taking the vast majority of first-team snaps in joint practices with the Redskins, whose star cornerback, Josh Norman, left the experience raving about Darnold’s skills and smarts. Now coaches and teammates want to get a look at him under game conditions against starters and most likely will do it again next week against the Giants. Bowles will not name an opening night starter if he can help it until the Jets take the field in Detroit on Sept. 10 and we see for ourselves. Meanwhile, he will have a convenient explanation when pressed should Darnold remain the No. 1 quarterback in August: Last summer Christian Hackenberg started the second and third preseason games, and that earned him nothing. This is different, of course. Hackenberg proved he did not belong, handing the job by default to veteran Josh McCown. 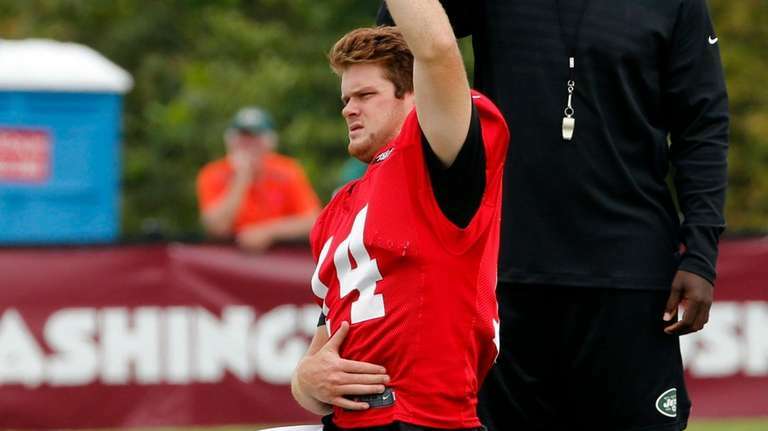 The assumption this summer is that Darnold will prove he does belong, leaving McCown as the league’s highest-paid unofficial assistant coach/mentor/cheerleader. If that happens, fans will have a right to be excited, but they also will get accustomed to reading reality-check stats that go something like this: 0-11, 3-13, 1-6. Those are the rookie win-loss totals for Troy Aikman and Peyton and Eli Manning. It’s a process. And the next step in Darnold’s comes Thursday night. Darnold said his one goal is improving in the mechanics of the position. “Getting in and out of the huddle, being able to call the play, have a clean huddle and hopefully get out there with 15 of 20 seconds left [on the play clock],” he said on a conference call after a rain-shorted practice on Sunday – the only time he was made available to journalists during his three days in Richmond. Teddy Bridgewater, who also looked good last week, presumably will again be the second man in at quarterback. If Bridgewater continues to demonstrate he has recovered from a major left knee injury he suffered two years ago, he could have some trade value. Bridgewater said that he felt fine physically after Friday’s game. He was philosophical about being relegated mostly to practice snaps with backups. Such has been the positive, drama-free nature of the quarterback trio so far. McCown could well find himself as the backup next month through no fault of his own, but he understands the situation. Should Darnold look good again Thursday, McCown’s help more and more figures to come from the sideline.